Red Ribbon Week | GUIDE, Inc.
We are excited to announce a brand-new campaign at GUIDE called Red Ribbon Year! Red Ribbon Year kicked off in November 2017 and ran through Red Ribbon Week in October 2018. See below for the details of our campaign and how we carried out this important celebration! During Red Ribbon Year, we are making it our mission to keep the conversation going about why it’s important to be alcohol, tobacco and other drug free – not for just one week, but all the time. The intention of this campaign is to help individuals and groups across Georgia celebrate being drug free all year long because we know prevention efforts are much more effective when they are continuous and sustained over time. At the beginning of every month, we will post here with how you can celebrate. You can expect us to highlight national prevention-related cause awareness days, relevant campaigns, events and project ideas. With your help, we can be all in, all year for prevention across the state of Georgia! When you participate, share your successes with us by using #RedRibbonYear on social media. If you have any questions about the campaign, please contact Alexis Cato at alexis@guideinc.org. This month we are celebrating the Great American Smokeout! The Great American Smokeout is a campaign of the American Cancer Society. Every year, on the third Thursday of November, smokers across the United States take part in this event to make a plan to quit smoking. Learn more about this event, why it is an important public health initiative and resources to help you celebrate this year’s Great American Smokeout on November 16, 2017 here. You can also read our blog post on this cause awareness day here. To take part in the Great American Smokeout, we have an activity you can do with your Youth Action Team or other group to celebrate both tobacco prevention AND the upcoming Thanksgiving holiday. Download the activity guide. Another great resource for tobacco prevention is the Georgia Tobacco Quit Line. It is a free, confidential public health service available to assist Georgians with quitting smoking and all forms of tobacco. Services are provided for any tobacco user 13 years or older living in Georgia. The Quit Line number is 1-877-270-STOP (1-877-270-7867) for English or 1-877-2NO-FUME (1-877-266-3863) for Spanish. Referral forms are also available in English and Spanish. This month we are celebrating National Impaired Driving Prevention Month! National Impaired Driving Prevention Month is observed each December to raise awareness about the consequences of drunk and drugged driving and to encourage making safe driving decisions. Due to an increase in impaired driving, the holiday season between Thanksgiving and New Years is the most dangerous and deadliest time to be on the road in the United States. To get more information about this important cause awareness day, you can read our blog posts: Help Keep Impaired Drivers off the Road This Holiday Season and The Importance of a Safe and Sober Holiday Season. To take part in National Impaired Driving Prevention Month, one of the things you can do is utilize some of the great campaign materials provided by the National Highway Traffic Safety Administration to discourage impaired driving during the holiday season. They offer fact sheets, shareable social media images and infographics, sample press releases, posters, videos and much more! In addition, the Governors Highway Safety Association offers a wealth of resources for states, such as the latest research, data, laws and programs, to help address the growing issue of impaired driving. Another great resource is the Centers for Disease Control and Prevention (CDC)’s campaign called Parents are the Key. Designed for parents of teen drivers, this campaign helps parents, pediatricians and communities keep teen drivers safe on the road. GUIDE has an accompanying handout on the Eight Danger Zones for Teens Behind the Wheel that can be downloaded in both English and Spanish here. Our YouTube video can be viewed here. This month we are celebrating National Drug and Alcohol Facts Week! National Drug and Alcohol Facts Week® (NDAFW) is approaching January 22-28, 2018. NDAFW is a national health observance linking teens to science-based facts to SHATTER THE MYTHS® about drugs! You can learn more about this via the National Institute on Drug Abuse (NIDA). There are several ways you can celebrate in both the national celebration and locally with GUIDE. One of the first things you can do to celebrate NDAFW is to get educated on the facts! Below are a few of our top resources to help you become familiar with important drug facts in two areas where we focus most of our prevention efforts: underage drinking and opioids. Do you think you’re up to speed on prevention facts? Put your knowledge to the test with our National Drug and Alcohol Facts Week IQ Challenge. Complete the below IQ Challenge, and you’ll be entered to win a $25 Amazon gift card from GUIDE! This is for youth AND adults; anyone can participate! Submit yours by January 28. The winner will be announced the following week. If you have trouble viewing the below form, please click here. This month we are celebrating Substance Abuse Prevention Advocacy Day! Join us for Substance Abuse Prevention Advocacy Day on February 21 at 10 am at the Georgia State Student Center in Atlanta. We will join agencies from across the state to talk about the importance of substance abuse prevention with our state legislators. Find out more about the event here. Anyone can be an advocate! This can be a great way to raise awareness for various prevention issues, such as underage drinking, marijuana use and prescription drug abuse. It’s vital to let your representatives know that prevention is important to you! To learn more about how to use your voice for advocacy, we have an informative blog post on the Six Keys to Effective Advocacy. If you can’t join us on February 21, don’t worry! There are many ways you can practice advocacy at home, such as by writing a letter to your representatives. Learn how to do this in our blog post, Tools for Advocacy: How to Contact Your Elected Officials. This month we are celebrating Patient Safety Awareness Week! Patient Safety Awareness Week is a part of the United in Patient Safety campaign run by the Institute for Healthcare Improvement and the National Patient Safety Foundation. This important cause awareness week serves as a dedicated time to increase awareness about patient safety among health professionals and the public. This year, Patient Safety Awareness Week is March 11-17, 2018. 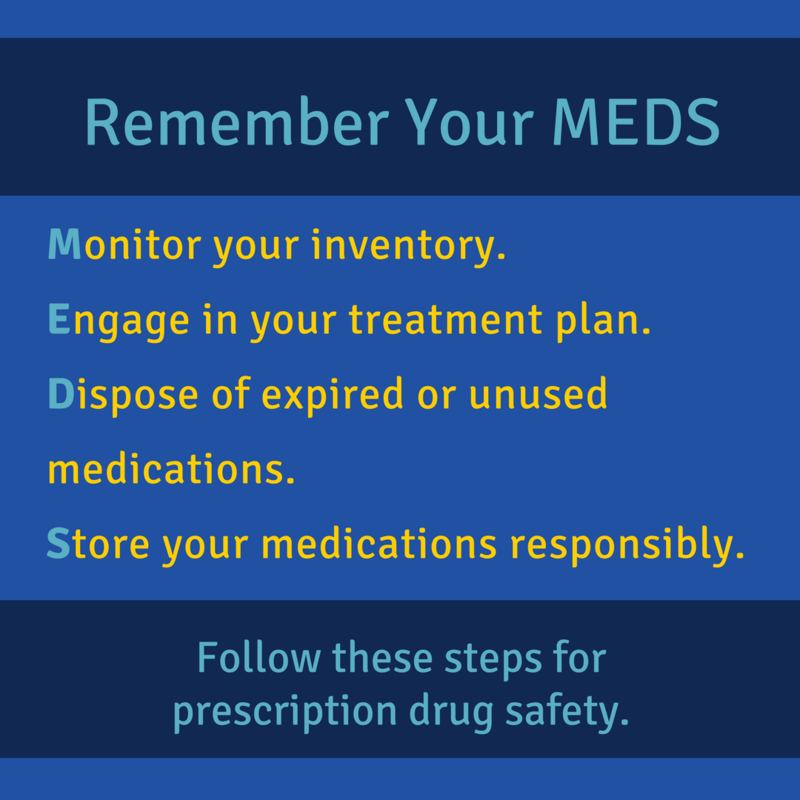 One of the areas in which GUIDE sees a need for patient safety awareness is around prescription drug safety. This includes several important factors such as encouraging patient engagement with their medical professionals, sharing the importance of taking medications only as prescribed and increasing knowledge around the risks of improper storage and sharing medications with others. Throughout the month of March, GUIDE will be sharing patient safety tips and resources on social media using the hashtags #PatientSafetyAwarenessWeek and #PSAW18. Want to get involved by sharing some important patient safety tips around prescription drugs? 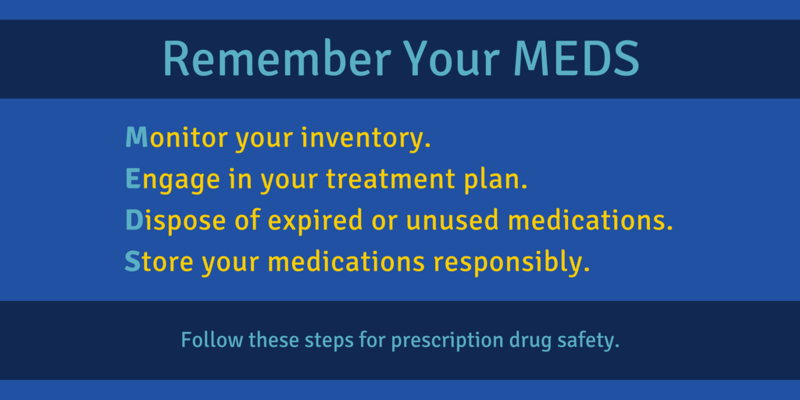 Read our latest blog post for a great start: Practicing Medication Safety by Remembering Your MEDS. You can download and share our image to accompany this blog post on Twitter and Instagram/Facebook. In addition, you can share with us your commitment to preventing prescription drug misuse and abuse by completing our pledge. This month we are celebrating Alcohol Awareness Month! In addition, you can share with us your commitment to preventing underage drinking by completing our pledge. SaveBrains.org – Learn about alcohol’s effects on the developing brain. Public Awareness Campaigns – GUIDE has several campaigns related to preventing underage drinking, all of which have accompanying materials available for free download or purchase. Underage Drinking Prevention PSAs – We offer multiple alcohol-related public service announcements, all available on our YouTube page for public education and sharing. Want to get involved by planning an Alcohol Awareness Month project in your community? Read our recent blog post for a comprehensive list of project ideas: Alcohol Awareness Month Roundup: Project Ideas to Celebrate Being Alcohol Free. This month we are celebrating National Prevention Week! Join us as we celebrate National Prevention Week on May 13-19, 2018. According to SAMHSA, “National Prevention Week is an annual health observance dedicated to increasing public awareness of, and action around, mental and/or substance use disorders.” This can be a great way to raise awareness for various prevention issues, such as underage drinking, marijuana use and prescription drug abuse. This year’s theme is Action Today. Healthier Tomorrow. This is encourages us to consider how making healthy day-to-day choices can ensure we have healthy futures. Anyone can participate in National Prevention Week! GUIDE has a great blog post about easy ways anyone can get involved: Celebrate National Prevention Week GUIDE Style. GUIDE is participating in SAMHSA’s Dear Future Me challenge! Look for our banner at events this month where community members can write the choices they’re making to live a healthy, happy life. Anyone can participate in National Safety Month! GUIDE has an informative blog post to accompany Week 4: Driving. It contains statistics related to distracted driving, information on Georgia’s new hands-free distracted driving law and resources for ensuring safe driving: Keep Communities Safe by Avoiding Distracted Driving. This month we are celebrating National Park and Recreation Month! The National Recreation and Park Association (NRPA) is the leading non-profit organization dedicated to the advancement of public parks, recreation and conservation. Every year in July, NRPA hosts National Park and Recreation Month to encourage people to explore everything that local parks and recreation has to offer. At GUIDE, we encourage youth and adults to find their natural highs, which are activities or events that a person enjoys and chooses to participate in instead of doing drugs or drinking alcohol. Local parks provide many outlets for natural highs, such as being physically active, enjoying nature, playing sports and spending time with friends and family. This list goes on and on. National Park and Recreation Month supports prevention efforts by providing community members with a dedicated time to get involved. Find a park to explore near you. Many tools are available to help you find a national, state or county park in your area. Get outside, explore a hidden gem in your community and find your natural high! Attend an event hosted by a local park. Join Gwinnett County Parks and Recreation for several events across the county this month that are free and open to the public. Host your own event. NRPA provides many resources to encourage agencies to host their own events to celebrate National Park and Recreation Month, including a Quick Start Guide, a materials Toolkit and much more. Showcase your adventures. Individuals can participate in celebrating National Park and Recreation Month by entering NRPA’s photo contest. Take part in the #NRPADiscoveryChallenge by submitting photos for each week’s theme for the chance to win awesome prizes! Anyone can participate in National Park and Recreation Month! We hope to see you get outside and explore in honor of this month’s occasion. See our blog post, Gwinnett County Parks and Recreation: A Valuable Partnership, for more information on how GUIDE works with the parks throughout the year. This month we are celebrating International Overdose Awareness Day! North America continues to experience the highest drug-related mortality rate in the world, accounting for 1-in-4 drug-related deaths globally (Penington Institute). In 2016, there were more than 63,600 drug overdose deaths in the United States (CDC). Opioid overdoses accounted for more than 2/3 of those deaths (HHS). Every day, more than 115 people in the United States die after overdosing on opioids (NIDA). See our blog post, Overdoses, Naloxone and the Georgia 911 Medical Amnesty Law, for in-depth information on the signs of a drug overdose and how you should respond in an emergency situation to save a life. For an informative one-page reference guide to this information, see our latest Inspired newsletter on Overdose Prevention. This month we are celebrating Family Day! Parents are the #1 influence in a teen’s decision to remain drug free. Research has consistently shown that teenagers who eat dinner more often with their families are less likely to drink, smoke cigarettes, or use other drugs (Center on Addiction). Research has shown that kids who have conversations with their parents and learn a lot about the dangers of alcohol and drug use are 50% less likely to use alcohol and drugs than those who don’t have such conversations (NCADD). Share a meal with your family. Research consistently shows that children consume more nutritious foods, eat more fruits and veggies, get better grades at school and engage in less high-risk behavior when family meals are a regular practice at home. Learn more from our blog post, The Power of Family Mealtimes. Talk to your kids about drugs. This is the most effective way to help your kids form their values, as well as set clear and consistent expectations around substance use. To get started on this, review our blog post, Drugs and Teens: What Every Parent Should Know, as well as resources from Ask, Listen, Learn and Partnership for Drug-Free Kids. This month we are celebrating Red Ribbon Week! The nationally-recognized, week-long celebration of drug prevention is October 23-31! Life is your journey. Travel drug free. You can engage in the National Red Ribbon Campaign by signing the National Red Ribbon Campaign Pledge and participating in the 2018 Red Ribbon Photo Contest. Now is the time to begin planning your Youth Action Team’s or other youth-serving group’s Red Ribbon Week project. Not sure where to begin? Here is a great list of prevention project ideas to get you started in our blog post: Red Ribbon Week Roundup: Project Ideas to Celebrate Being Drug Free. Join us at Rock Springs Park in Gwinnett on Thursday, October 25 from 5:30 – 8 pm for Live Healthy Gwinnett’s Walk Among the Stars event as we celebrate National Lights on Afterschool. Learn more here. Participate in the DEA’s National Prescription Drug Take Back Day on Saturday, October 27 from 10 am – 2 pm. Learn about the event and how you can participate here. Follow GUIDE on social media @guidegti to see our posts related to the current month’s theme and how you can help us spread the word about the important cause! If you participate in celebrating Red Ribbon Year, share your successes with us by using #RedRibbonYear on social media.